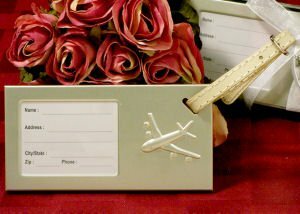 Invite your guests to fly along with you - at least in spirit - when you present them with these fun and useful luggage tags. Each pearlized silver metal tag features an embossed airplane and cream-colored leather strap for attaching to your luggage. The gift boxed tag measures 2 1/2" by 4 1/2"
Includes an address label ready for you to fill out. Does the Luggage tag come with a gift box? 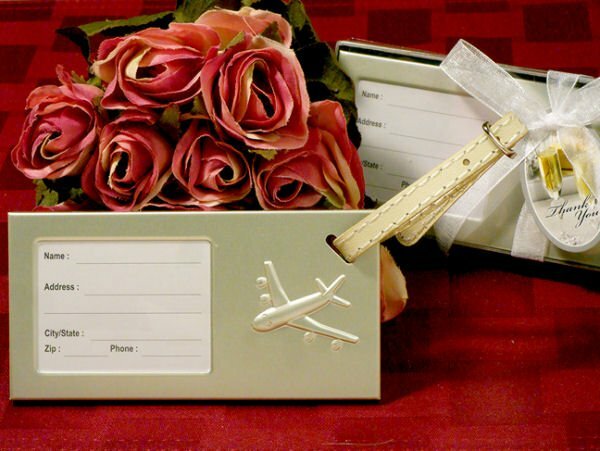 The Come Fly With Me Luggage Tag comes with a gift box. It measures 2 1/2" by 4 1/2" and includes an address label ready for you to fill out.